This original painting is executed in oils with an addition of other media to create a three dimensional quality. 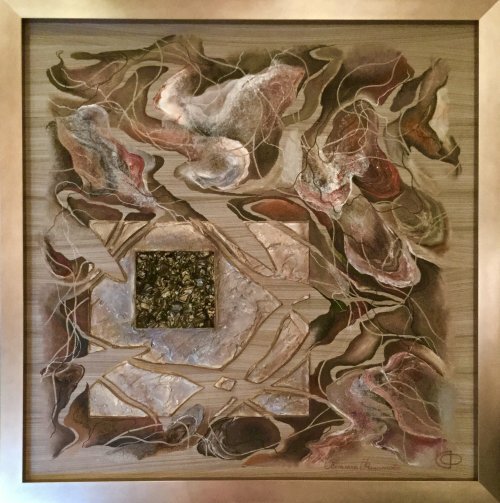 This work is painted on a wooden board allowing the viewer to appreciated the juxtaposition of the wood grain and the smooth surface of oil paints, layered to achieve a complex and exciting composition with depth and lots of fine details. Predominantly in neutral colours, the aubergine, copper and browns make this work easy to place in most interior schemes. Soft and warm silver tone frame in a contemporary chunky design completes the look.